Workers confront scabs as they leave for the day. As the strike nears the end of its second week, Verizon workers remain determined and steadfast on picket lines across the Northeast. In Syracuse, NY, workers are picketing at Verizon buildings downtown and on the city’s eastside and other outlets. 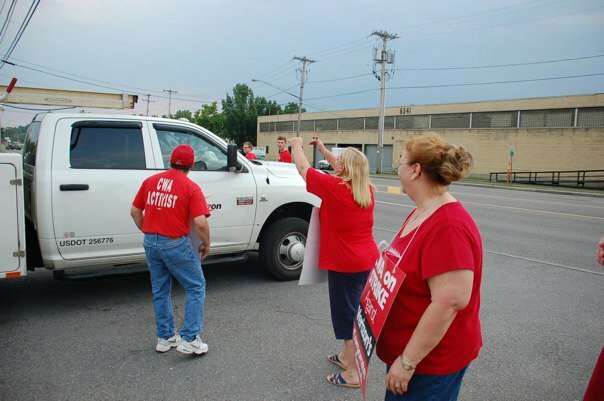 On Thompson Rd., workers are holding a 24-hour picket. Workers come in four-hour shifts and are supported by union and non-union workers alike. Over the last 13 days, nurses, teachers, AT&T and UPS workers as well as activists from different social justice and community organizations have joined the workers on the picket line. Many stop by with pizza, brownies, water and other snacks. In a cowardly effort to intimidate workers, Verizon has installed a 24-hour surveillance camera atop the building on Thompson Rd. and at many other locations. Verizon has used the legal system and police to prevent workers from confronting scabs and management. For several days after the court issued an injunction, police watched the picketers constantly. Still, whenever a car approaches the gate, the picket line closes around or near the vehicle. Workers shout “Scabs go home!” and “Traitor!” The unity that Verizon workers are displaying in their struggle is truly inspiring. For now, management and out-of-town scabs are working 7-7 shifts at Thompson Rd. On an average day, 50 trucks leave the premises to make repairs. The strike has reduced the number of trucks to five a day. This is just one statistic among countless others affirming that it is the workers who make Verizon run. It is the workers and they alone who produce the profits that the owners now want to take a bigger portion of. The ANSWER Coalition urges everyone in Syracuse to move their feet and join these courageous workers on the picket line, either at Thompson Rd. or at S. State and E. Fayette downtown. If you attend the Thompson Rd. picket, you can park in the lot across the street.